Holster and folding litter gun for occasional users. Keep your grabber close at hand for quick pick up of random litter. 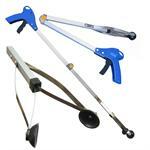 Holster loops over belt, hangs on wall, tractor or mower. 32 inches long quickly flips in half for storage. 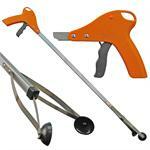 Litter pick up tool with bright orange handle and long-lasting METAL folding joint. Easy storage. 32 inches long. 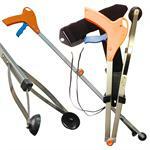 Pistol grip home use reacher with durable METAL folding joint. Positional lock. 32 inches and folds in half for easy storage.